Set within the Görlitzer Park, Das Edelweiss is a stylish combination of a terrace, where you can enjoy sitting in the sun with a cool drink, as well as a restaurant, featuring traditional German cuisine with a modern twist. Most importantly, however, there is the Club. The club has two rooms, the Partykeller, and the Lounge, both of which can be rented for private functions. 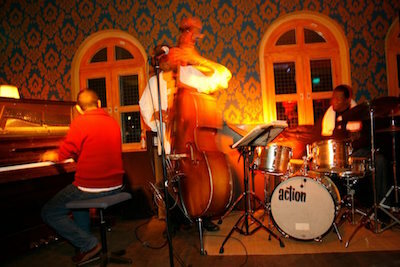 The Lounge hosts the weekly New Standard Jam Session - featuring a variety of different jazz styles. Worth checking out! We currently have no events scheduled for Das Edelweiss. Please check out their website to see if there's anything we might have missed. There is a weekly jam session at Das Edelweiss on Tuesdays at 22:00. For the full programme please visit the Das Edelweiss website.